After two brilliant albums in the new millennium and a back catalogue of great-to-magnificent material as their legacy, what could one expect from Tarot anymore? More magnificence, of course, which is the main reason why Gravity Of Light doesn’t carry on the streak of unrelenting superlatives that really began to fly starting with Suffer Our Pleasures. The dark, intense metal of their previous two albums is joined here with a more-than-noticeable touch of the hard rock-vibes that were most evident on the band’s first two albums. This change in itself has nothing to do with the momentary dips in quality. Flying on the strength of Marco Hietala and Tommi Salmela, Tarot is probably the most consistent metal band out there today in terms of vocal excellence – just flawless heavy metal ownage on the mic when these two men duel it up. The band plays tightly, Zachary Hietala’s guitar solos are ever-present, tasteful and impressive, the progressive hints and minor futuristic sample sounds are present, the production work is hard as iron and on the surface everything kills. Just when looking at the overall song material and putting it up against even the near past, the quality isn’t quite there. The awesomely titled Satan Is Dead opens the album in a classic high energy 70’s heavy rock-meets-modern-metal-sheen-style that Tarot has always excelled in. Hell Knows slows it down for a more menacing attempt but besides the vocal work, the magic just isn’t there as powerfully as on the other slow crusher on the album, the Sabbathesque Magic And Technology. Between them, two excellent high speed rockers, Rise! and Pilot Of All Dreams, tear it up all over the place. Especially the latter with a turbodriven Rainbow-feel and a very infectious chorus makes my fists fly high – a song that goes straight into the band’s pile of rapid live favourites such as Angels Of Pain and Descendants Of Power. Four great ones out of five is a damn fine start which is unfortunately halted when Calling Down The Rain never gets on with the kind of hard rocking that one would wish and Caught In The Deadlights is a stunningly mediocre cut for such a good band. I guess this mid-tempo piece is aiming for some kind of atmospheric, somewhat hypnotic churn with a heavy emphasis on harmonizing vocals, but the sheer boredom that the chorus causes me is just unexpected. Fortunately the album’s introductory single, I Walk Forever, raises to roof quickly enough afterwards. This ever-growing, majestic ballad is probably the song furthest away from the sound one would usually associate with Tarot, but it doesn’t stop this epic piece from ruling (awesome chorus!). I’d also say that fans of Nightwish who venture into checking out Tarot due to presence of Marco with this new record should be thoroughly sold by this track. Sleep In The Dark is my other favourite off the album, as it brings up the kind of slightly proggy guitar riffs, keyboard melodies and simmering aggression that made the band’s 90s albums so great. Gone finishes the album with a melancholy mix of acoustics morphing into a threateningly heavy chorus, which promises awesome things but is left feeling just a teensy bit flat. Still a good track with a lot of emotion in the vocals. Gravity Of Light is one of those classic examples when a band you love with every drop of cold blood in your veins makes an album that is really good, but it makes you feel that it’s “just” really good. You know, when you’re used to masterpieces, what can you do? It’s certainly not a fair position in the end and I’ll openly admit my occasional frustration in being a reviewer who is unable to look at albums of seriously established artists as single pieces but always brings in the earlier accolades. Just wanted to bring that out because I personally feel a real conflict in giving this baby a score that I feel is appropriate(ly high) yet feeling that the overall vibe of my review is negative, or at least one that would hint that this isn’t a good album. 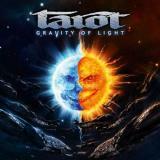 Gravity Of Light is a very good album and fans of Tarot, especially those looking forward to a slight return of the hard rock-elements of their earlier days, will find oodles of enjoyment here.